I ordered this outdoor cat tree made of cedar with stainless steel hardware. It was challenging to assemble but I am not a woodworker or all that strong. It may be a snap for some of you to put together, but it took me about 5 hours. My cats have yet to go on it, but they lay down at the bottom of it and keep looking at it. I am not sure where I am going to position it yet. I got rid of a bunch of patio furniture so right now it is under the roof line in the middle of the area where they like to hang out. A very interesting cat tree. Unusual that Grace and Blondie didn't hop up on it immediately. We couldn't get the last piece on the cat trees without Raiden jumping up on it. You may need to add some catnip to it to entice them. It appears to have a sturdy base. It's just different from other cat trees that normally have carpet on them. Congratulations on getting it put together!!! You got rid of most of your patio furniture so now there are fewer options. Hope you can post a pic of them on the cat tree soon. Looks great, Jill! Grace is out there now sitting in her comfy chair across from it, just staring at it. It's just a matter of time, everything gets explored. Soon Grace will be sinking her teeth into that nice soft cedar. I'll be interested to see how that tree is used by your cats. It seems a bit counter-intuitive to me that they'd make a cat tree out of wood... but then use a conventional design, like it were made out of cardboard and carpet. What I means is... wouldn't a more effective tree just be an actual small tree trunk (i.e., round with bark and moss and all that?) with some platforms at the top (plus some way to get down)? But with it being wood, and not having anything to grip (i.e., bark or sisal, or carpet), and it being square, I dunno... it will be interesting to see how a cat reacts to such a strange thing! They do have some that look like actual trees. My vet has one in their cat playroom. Well the thing about this one is that it can be positioned out in the rain and not rust or rot. I will eventually put it out on the edge of the patio where they like to hang out and climb up the lounge chairs to get higher. I will show them how it works over the weekend with catnip or treats. There is no carpet but the wood is somewhat rough and very soft so their talons will sink in and give them traction. I believe they can jump from ledge to ledge without using the base. Sort of like stairs to the top. I am not quite sure how getting down from the top platform will work. 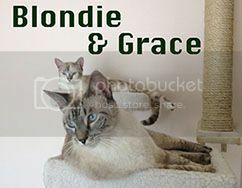 I think Blondie will use it more than Grace as she is like a little monkey and scampers up and down things very quickly. Grace uses her muscular back to throw her body around her kitty gym. She is not a very good jumper. I wonder if some outdoor carpeting might help on the steps. It's just something different from what they have been enjoying out on your patio. It's nice to have a great tree out there you don't have to worry about getting wet. I had to cover the one in Raiden's enclosure when we get severe thunderstorms as his entire enclosure will get wet through the sides and I know the tree will fall completely apart if it gets wet. Can't wait to see pictures of them on the tree. Well I put catnip on the steps and now they lay under it and rub all over it, but still not going on it. Plus it is so beastly hot and humid out. I can see them getting more curious about it in the cooler weather. This morning I found Grace laying inside the house in the A/C in front of the slightly opened door with the shower curtain contraption. They like it out there in the dark but once that morning sun is blazing, they come inside. Is the tree made of cedar? Cedar has an odor (I find it nice), but the cats may not appreciate it until it's weathered a little bit. Hopefully this won't be like the cat wheel. Speaking of cat wheels, this morning Raiden hopped on his and ran like the wind for a couple of minutes. He's only just "walked" on it. He still uses it almost daily -- and sometimes he will hop on it four times a day. 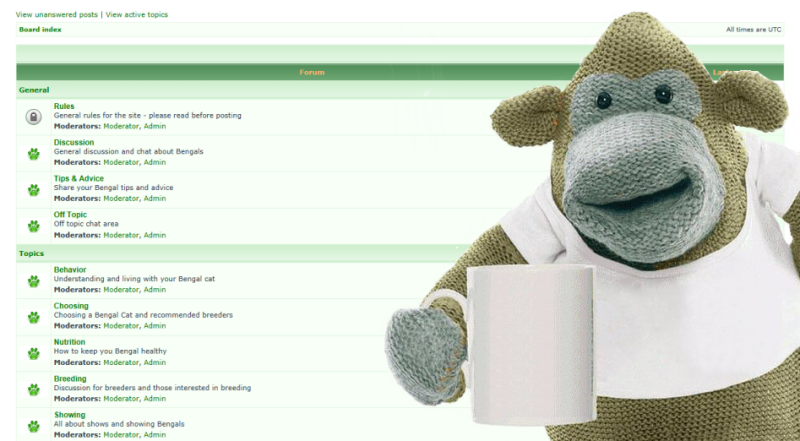 He was on it three time already this morning. He just hops on it all by himself. Hopefully, Grace and Blondie will get used to the cat tree and want to check it out. Laying higher up is what bengals like. Have you picked them up and placed them on a platform yet? Have you placed a favorite toy on the bottom platform? I don't think they put sisal on this as the rope would remain wet and it probably would not be good for the wood with mold and possibly rot. I put Blondie on the second landing from the bottom with some catnip. She stayed there about a minute and jumped directly to the ground without hopping down the lower step. Yes it could be the smell, it is fragrant especially with all the humidity and occasional showers. They hang around it so I don't think it repels them but it definitely has an unusual smell for them. They boycotted the cat wheel for a long time and now Blondie uses it daily. Grace has never been the least bit interested in the wheel. Blondie was running on it late last night. I cluck with my tongue and tell her she is a good girl and she starts running again. She goes all the way to the top and stops and lets the wheel swing her back and forth. I imagine it is like a kid on a swing, sort of a thrill. I am going to tie some toys to the outdoor tree and see if I can get them on it with treats over the weekend. Hang in there, Jill. The fragrance of the cat tree may be just too much for them right now. The wood will weather and things should be good. Glad to hear the cat wheel is getting some use. Raiden was on it this morning again. Last night he hopped on and off of it quite a bit and at one point was running. When he stopped, he went up the back of the wheel and fell off. It was quite comical. Just happy he uses the wheel on his own. We've not had to entice him after the first day and then he went months without stepping on it. Now he will hop on it throughout the day. Need to get a good video, but by the time I get the iPad out, set it up and turn on the lights so the wheel shows up in the video, he is off it! Yeah my cats do their acrobatics at night when I get into bed. They are flying up the clouds to the ceiling and leaping up the wall and screeching down with their nails engaged, flying across the bed to the kitty gym and going up and down that, jumping on the cat wheel etc. I always think I wish I had my camera and there was enough light…If I left the room to get it they would stampede behind me. Turning a light on would stop them in their tracks.